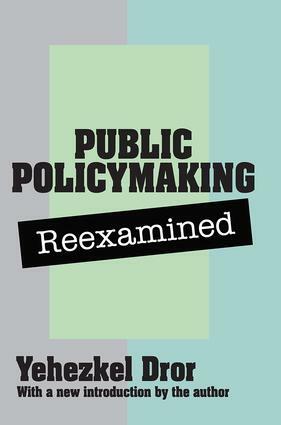 Public Policymaking Reexamined is now recognized as a fundamental treatise for public policy studies. Although it caused much controversy when it was first published for its systematic approach to policy studies, the book is acknowledged as a modern classic of continuing importance for the teaching and research of public policy, planning and policy analysis, and public administration. The paperback includes a new introduction updating and supplementing many of the author's original ideas.Professor Dror combines the approaches of policy analysis, behavioral science, and systems analysis in his examination of the reality of public policymaking and his suggestions for its reform. Actual policymaking is carefully evaluated with the help of explicit criteria and standards based on an optimal model approach, resulting in detailed proposals for improvement. He applies a scientific orientation to the study of social facts and theory.